Thus our church was born. We were two months young, and the first new family—Mom, Dad, and two kids—was saying We’re in! We were excited, but not sure what to do—have them sign a paper? Take a class? Go through a ceremony? Okay, maybe not so simple. But before long we had a band with amplified music, our kids felt the adventure, and we had the experience every Sunday that connecting with Jesus was good. And that someone else also liked what we were doing meant that maybe, just maybe, there was something of substance to our efforts. A couple months in, we weren’t growing and weren’t sure we’d make it. So we fasted and prayed for three days, asking God, “What should we do?” The day after fasting, we heard God more clearly than ever: Spend the money and do church for real! Someone, you see, had given us a financial gift to help get the church off the ground. But wanting to be responsible, we had conserved the money. We then remembered the story from Jesus that we had just taught in church about a Master who celebrates those who invest his gifts while chastising those who hide them. And so we went all in. We shifted from one service a month to four, bought sound equipment, hired workers for Sunday, and began advertising. We felt joy from God’s encouragement, and the rest, as they say, is history. We grew during our six months at Mercy, moving from a small room to a big room to—count them—TWO rooms, and then, bursting at the seams, the Rec Center opened up. We started Sunday morning church services at the Robert A. Lee Recreation Center in downtown Iowa City in the Spring of 2000, and met there for the next ten years. The Rec Center was for us the worship-in-a-van developmental stage of so many young churches—all our music gear crammed into a white van that we unloaded and set up before and tore down and packed away after every Sunday service. It being the community center, we also learned to share. Some Sunday mornings we’d make our way upstairs through a throng of triathlon competitors, other weeks a volleyball tournament, but the best was the Community Theater. At least twice a year we’d arrive to find the fellowship hall taken over by Death of a Salesman or Fiddler on the Roof or once a WWI play where the congregation hid under camouflage netting while we preached the peace of Jesus from a bunker. We tried for a while doing church in the gym, but the acoustics were like being inside the head cold of Zeus, so the fellowship hall was our sanctuary. Growth made us more stable, which happily made us more able to give. In 2005 we formed Hands on Faith, through which our church has served community agencies like Habitat for Humanity, the Iowa City Homeless Shelter, The Crisis Center Food Bank, Hope Lodge, the Free Medical Clinic, the Domestic Violence Intervention Program, and others. We helped clean up our city after a tornado and filled sandbags against rising floodwaters. In March of 2006, stretching beyond the local, we started what has become our longest running ministry, a medical service effort to colonias on the outskirts of Mazatlan, Mexico. From this foundation, we continue to support with money and labor our local schools, neighborhood centers, and really anyplace that helps people. So thank you to the Rec Center! But after the semi-nomadic set up and tear down phase of life, we were ready for a place of our own. We searched for three years, almost signed a contract four times, and had essentially given up on finding something we liked when two of our members said, You should check out this place in Coralville. We went and looked: high ceilings, unfinished interior, lots of square feet, good access, and plentiful parking. Sold! Generously supported by our members, we put up walls and bathrooms, lights and speakers, and waxed creative in the Kids’ Wing. 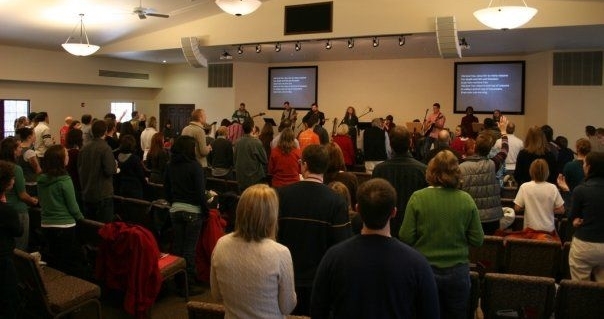 In December of 2009, we held our first service in our new home. We use the space for myriad gatherings throughout the week across the year and we love it all—the sanctuary, foyer, kids’ space, kitchen, and yes, even the bathrooms. Our church came into existence as the Vineyard Community Church of Iowa City, a member of the Association of Vineyard Churches. Tom and Adey had come to faith in a Vineyard church in Evanston, Illinois, and brought to us all the good things Vineyard had given them: a relatable connection to the Holy Spirit, a come as you are welcome, and an alive experience of music and worship. We existed happily as a Vineyard for years, but about the same time that we moved to our new location, we became aware that our church and Vineyard were moving in different directions. Within Vineyard, we had become part of a group of churches called Blue Ocean Faith that were united by similar cultural settings—primarily secular, often academic—and by a desire to be completely welcoming to all. We had come to see church not so much as something you belonged to or not, but as an approach to life built on finding and moving towards Jesus. These and other thoughts put us at odds with Vineyard to the degree that, in the Fall of 2014, Blue Ocean Faith emerged as an independent group of churches from Vineyard with us as a charter member. On the far side of the transition, church life is awesome. We’re no longer asking Vineyard to be something they’re not, we feel free to live fully into our unfolding identity, and we sense the pleasure of Jesus as we embody him in our particular way in Iowa City, Coralville, North Liberty, and Beyond! One of the funnest parts of the whole emerging process has been the opportunity to name and symbolize ourselves. How often does anyone get to do that? So we made an event of it. We invited the whole church to a naming party where we played naming games to liberate naming creativity. We had a naming committee that followed up the naming party with weeks of naming discussions. We sifted through dozens of possibilities—Open Table, Thrive, The Bagel Church, and from the Kids’ Wing “Shooting Stars Community Church”—before choosing Sanctuary Community Church. While no single name captures everything (we thought for a moment about “Thrivuary”), Sanctuary has deep meaning that we love. To us, Sanctuary represents an alternative space from business as usual. When you enter a Sanctuary, you leave behind environments dominated by fear, pretense, anxiety, and judgment. You leave behind not measuring up, concerns about your standing with God, and enter a “condemnation-free zone,” a space of welcome and peace and quietness where you can connect again with how life is meant to be lived. In that space, you can encounter Jesus, hear his good voice speaking to you, and from there go out to bring the world around you to life. Sanctuary also inhabits a central biblical theme of humans connecting with God. One way to read Genesis 1 is as a description of God building a Sanctuary called Creation that He comes to inhabit on the seventh day. Then there’s the fancy tent in which the Israelites meet with God in the desert, the temple built while Solomon was king, and in the New Testament, the temple of human individuals called the Church that is inhabited by the Holy Spirit. All these sanctuaries were special because in them God and humans had overcome seemingly insurmountable obstacles to their connecting and had come to happily occupy the same space peacefully together. Woohoo! And most importantly, a favorite local pub, The Sanctuary, was happy for us to use the name as long as we don’t serve too much wine at communion :). So how are we doing, all these years down the road, with those “simple” goals? Well, we connect with God in a life-giving way every Sunday and throughout the week. Our (Tom and Adey’s) youngest child Caleb, born six months after we came to Iowa City, has now graduated High School and is off to college. He and the rest of our kids have fond memories of church and meaningful connections to God, and lots of other Sanctuary kids are following in their footsteps. 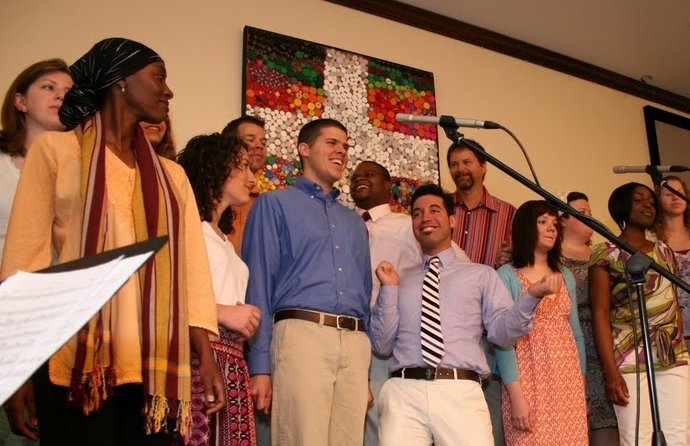 We joyfully welcome anyone fully into the life of our community. And Sunday is our constantly relevant foundation for Monday and Tuesday and all the days that follow.